As the year of the supershopper, this upcoming holiday season is a great opportunity for retailers to reach these savvy shoppers in order to boost sales and even create lifelong customers. What can you do to make sure these shoppers choose you when they’re ready to make their conversion? Oh, They’re A Fickle Group! It should be particularly exciting to hear that half of all of last year’s holiday shoppers are open to purchasing from new retailers and, in fact, 76% of smartphone shoppers changed their mind about which retailer or brand to buy from after searching on Google. That means that savvy shoppers are no longer as brand-loyal as they once were. With so many options available at the click of a button, supershoppers are more concerned about finding the perfect product or gift idea – regardless of where they find it. Mobile is the go-to source for supershoppers looking for inspiration. This immediate access to the online world is exactly how any shopper can become a supershopper. In fact, 64% of smartphone shoppers use their mobile devices to search for shopping ideas before they head into a store. These shoppers use their devices to not only make purchase decisions, but also to discover new brands and products – presenting the perfect opportunity for your brand or products to make an impact – so long as you have a strong and comprehensive mobile presence. There’s been a growing trend among online searchers for “the best.” Mobile searches related to the phrase “best gift” grew 70% year over year, while searches related to “cheap gifts” grew by only 35%. This pursuit of quality gifts inspires supershoppers to do some extensive research to make sure what they do end up buying is the best product they can afford: YouTube mobile watch time for product review videos grew 60% over the past year. Online retailers should also promote unique, and personalized gift ideas. Mobile searches related to “unique gifts” grew more than 65%, while mobile searches related to “cool gifts” grew a jaw-dropping 80%. Reaching today’s supershopper means being present on mobile. Use mobile bid adjustments to make sure that your brand is present no matter when people shop. Use mobile URLs in expanded text ads to send mobile users to the right pages. Use a combination of search and video ads to reach shoppers across all digital touchpoints. Use Smart Bidding in AdWords to maximize your performance. Help shoppers discover your brand and products through category keywords and audience targeting formats (like TrueView for shopping). Review your click-share daily to make sure you’re not losing out on shoppers who are ready to buy. Increase bids and budgets as conversion rates rise, and make sure to keep your campaigns running after the holiday season ends. In today’s day and age, everyone has the potential to be a supershopper, the person who has the ability to know where to buy the latest and greatest products available. This presents a wonderful opportunity for online retailers to get their brand and products discovered by a larger audience who is open to purchasing from any retailer. 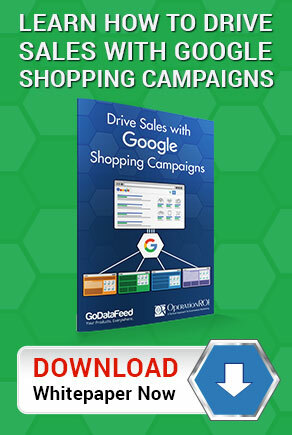 Learn more about how the OperationROI team can help you target and capture these supershoppers not only this holiday season, but all year long. Call us at 1-888-277-5429 or fill out our contact form today! Not Targeting The Supershopper? Contact Us Today!